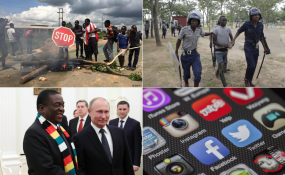 Johannesburg — THE Zimbabwean government appears to have shot itself in the foot with the shutdown of the internet following violent protests. "We estimate the shutdown will cost your country $5,742, 421 per day (R79.5 million) in direct economic costs, and will slow the realisation of economic, social, and cultural rights broadly," the #KeepItOn Coalition stated in a letter addressed to Kazembe Kazembe, Zimbabwe's minister of Information Communication Technology and Cyber Security. The #KeepitOnCoalition told government disruptions also destabilised the internet's power to support small business livelihoods and to drive economic development. A 2016 study by the Brookings Institution, a prominent think tank, revealed that shutdowns drained $2,4 billion (R32.9 billion) from the global economy between 2015 and 2016. "Internet shutdowns harm human rights and economies." "Internet shutdowns must never be allowed to become the new normal." Meanwhile all Zimbabwe newspapers' online presence (websites) on Wednesday could not be updated as effects of internet shutdown impacted on media.